The Prineville Swim Team split into two squads this past weekend, sending most of their older swimmers to Redmond for the Jay Rowen Open, while the majority of their younger swimmers went to Lakeview for the Lakeview Lions Invitational. Both meets were held Friday through Saturday. Despite splitting the team, the local swimmers still had success, taking third in both meets. "Both meets went really well," head coach Halley Estes said. "The older kids went to Redmond in order to compete against more advanced swimmers, while the younger kids on the team went to Lakeview with me." Estes added that the high point of the Lakeview meet was Owen Mickle winning high-point honors in the boys 8 and under age group. Mickle won both the 50-meter freestyle and the 25-meter backstroke, as well as finishing second in the 25-meter freestyle. A handful of other swimmers also won races in Lakeview. Adisynne Hensley won the 6 and under girls 25-meter backstroke, while Thaddaeus Estes won the boys 6 and under 25-meter freestyle, Cameron Carr took first in the boys 11-12 50-meter breaststroke, and Emma Hehn was first in the girls 15-18 100-meter breaststroke. 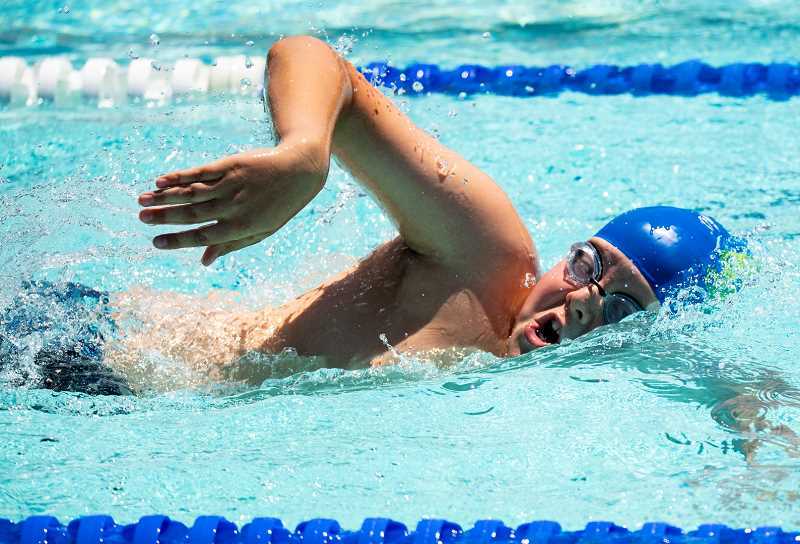 The swim team also won a trio of relays in Lakeview, winning the boys 10 and under 100-meter freestyle, the girls 12 and under 200-meter freestyle, and the boys 12 and under 200-meter freestyle races. Landon Lockling, Riddley Barker, Brady Hugie and Caleb Decker swam the 100-meter relay in 1:23.75, while Corley Holliday, Keera Morgan, Haylee Noland and Emma Holliday had a time of 2:56.41 in the longer 200-meter relay. Birch Barker, Maison Bell, Zachary Levesque and Carr combined to win the boys 200-meter freestyle relay. Klamath Basin Aquatics took a narrow victory over the Lakeview Swim Team to win the team title. The Klamath team finished with 613 points to 590 for Lakeview. Prineville Swim team was next with 451 points, followed by John Day Swim Team, 135, and Hi-Desert Swim Team, from Burns, with 113. Estes was quick to point out that Klamath Basin is a year-round swimming program, while Lakeview had their full roster of swimmers at the meet. With just a handful of swimmers competing in Redmond, the Prineville Swim Team had no opportunity to contend for the meet championship. Still, the team had a solid placing against several year-round swimming programs. The host Redmond Aquatic Club ran away with the meet, amassing 852 points. Albany Aquatics Association was a distant second with 553.5 points, while the Prineville Swim Team was next with 223.5 points. Rounding out the scoring were Madras Swim Team, 162, and unattached swimmers with 62 points. The Prineville Swim Team did most of their damage in the 15 and over male division. Jacob Hehn was the high-point winner in the age group with 39 points, while Colin White was next with 27 points , Bailey Parrott third with 26 points, and Garrett McMichael fourth with 24 points. Hehn led a Prineville Swim Team sweep of the 200-meter individual medley, with McMichael second and White third. In addition, Noah and Emilio Todd finished fifth and sixth, respectively, in the race. Parrott won the men's 50-meter freestyle, while Hehn was third, Emilio Todd fourth, White fifth, and Noah Todd sixth. Hehn won again in the men's 100-meter butterfly, 100-meter breaststroke, the 200 breaststroke and 200-meter freestyle, while Parrott took first in the 100 and 200-meter backstroke races. As well as the older boys did for the Prineville Swim Team, it was 13-year-old girl Rylee Sakraida that Estes wanted to talk about. Sakraida won the girls 1,500-meter swim, a grueling event that took her 25:08 to complete. She was also second in the girls 13-14 800-meter freestyle. "She did really well for her age," Estes said. "She is very fit, and she's quite a swimmer." The Prineville Swim Team will split their team once again this weekend as the majority of the team will go to Burns, while most of the older swimmers will go to a meet in Klamath Falls. Estes said that the plan is to get the older swimmers lots of competition against year-round swimmers so that they are prepared for the Cascade East District Meet, which will be held in Prineville the end of the month. She added that with the strength that Lakeview showed at their home invitational, the district meet could be a real dog fight.